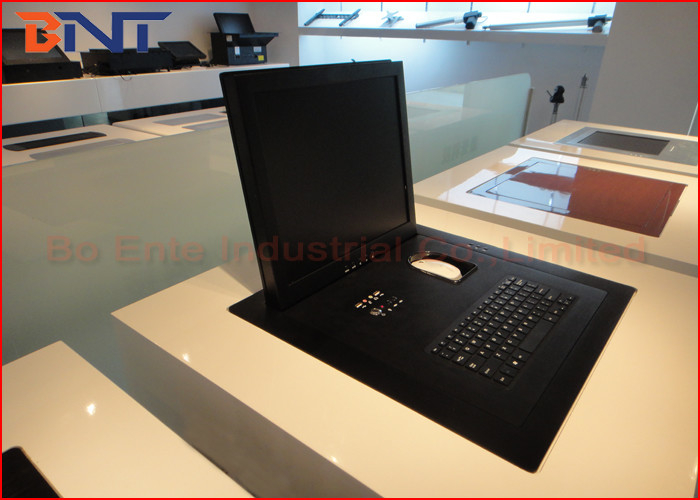 Computer monitor lift integrated with 17~19 inch screen, designed for advanced conference system, like luxury conference room, trading room, meeting room, multimedia network system and high-grad office. 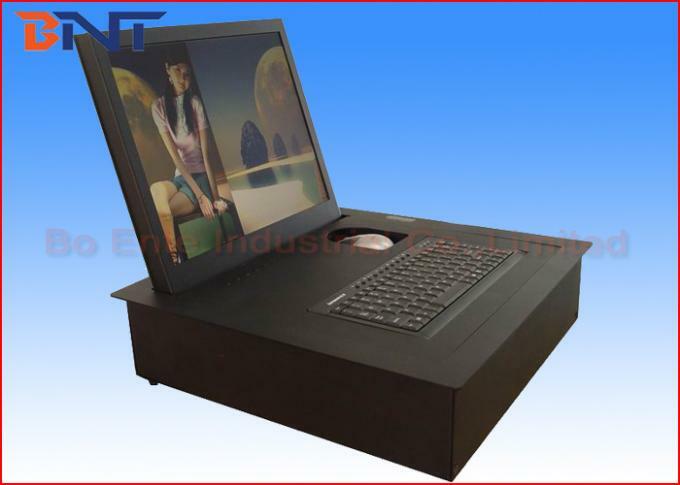 When multimedia meeting, computer monitor lift can be flip up separately, grouply or all display the multimedia information including the meeting content, information hint and picture information, video or audio information. When turn on computer monitor lift, the screen will be overturn 90, 105, 120 degree, keyboard and mouse will also rise to the same position on the desktop. When turn off computer monitor lift, the screen, keyboard and mouse will be flip back to the case and hidden into the table underside. The product adopts intelligent circuit board, powerful motor and sensor. It runs smoothly, quietly, and provided with the protection function of the monitors by cutting the power off automatically. The panel switch adopts the durable and excellent material and nice-looking film switch. The product support RS232 communication protocols. It can be distantly controlled by central control. It supports wireless connection too, possessing the function of organizing the monitors into groups freely. 1, Whole complete lifting equipment integrated with 17 inch screen, keyboard and mouse. 2, Made of 6mm thick aluminum alloy drawing panel and brush aluminum alloy monitor shell, provided smart, elegant and high grade appearance. 3, Made of aluminum alloy panel and monitor shell, adopt imported circuit board, synchronous motor,and infrared ray sensor to provide most safe environment for users. 4, Supplied with highest safe operation protection, mechanism adopt infrared ray sensor to provide safe environment for users. During screen motorized flip up or down, it will stop if stuck by hands, finger, pan or book during operation. And will continue working if barrier get always. So it would protect hands or finger from jammed. 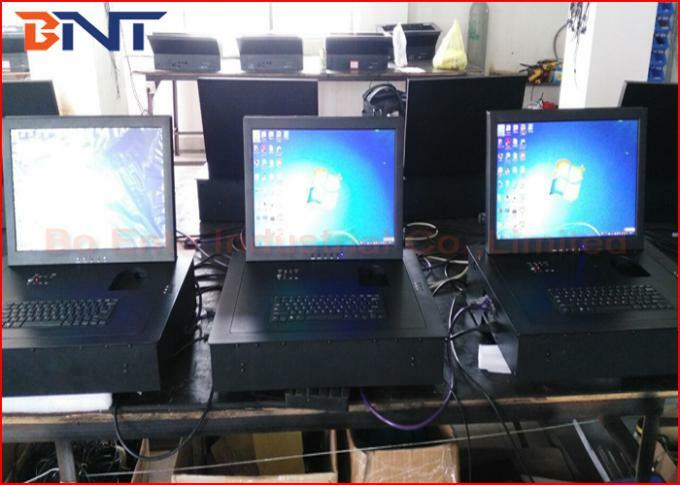 5, Product adopt circuit board to supply the most steady and safe during monitor flip up or down. 6, Confirmed by researching, the screen, keyboard and mouse would be complicated with flip up mechanism, won’t create any electricity influence for monitor if mechanism is working. 7, electricity supply and shut down design, the screen, keyboard and mouse will be power off once flip down, lifting back to mechanism. And screen, keyboard and mouse will be supplied with electricity if complete open the mechanism. 8, Could integrated with touch screen, front camera, all in one computer as required. It’s widely used for video conference system, TV conference system and financial analyzing system and other audio video solution system.